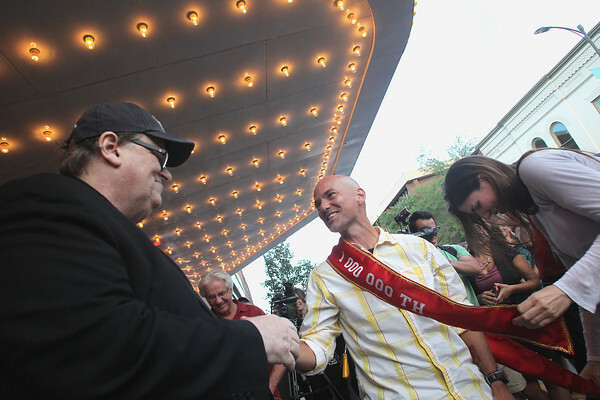 Filmmaker and Traverse City Film Festival co-founder Michael Moore, left, congratulates Sandro Barros (cq) of Plainfield, Indiana, for being the one millionth paid admission to the State Theatre Thursday as Film Festival Executive Director Deb Lake, right, places a sash around him. Barros and his wife, Alexis Bacon (cq), arrived for the 8:30 p.m. screening of "The Company You Keep." Barros received a lifetime pass to both the State Theatre and the Traverse City Film Festival, as well as gifts from other area businesses. The theater, originally opened in 1918 but shuttered in 1991, was used by the Traverse City Film Festival starting in 2005 before being renovated and reopened year-round in 2007.